This is a new blog discussing ways to get to product/market fit faster. The first post was written as a humorous (but very real) list of events that often happen inside a startup when you are a cofounder. I think I’ve personally endured every one of those steps myself at some point. The second post made the point that “overnight success” startups really aren’t. All successful startups had to iterate in some way or another to get there. This post kicks off a series of methods for accelerating startup iterations with the goal of getting you to product/market fit faster. It’s not theory from a whiteboard. It’s based on things that have been tried, tuned, and effective across a number of companies (well, startups) in Silicon Valley in a variety of markets. Each subsequent post will describe specific things a startup can try (with real examples) to help accelerate product/market fit. A struggling startup is painful and exhausting. It can drive an entrepreneur bonkers wondering where it went wrong. Cofounders of a failed startup even go through a grieving process. For all you entrepreneurs who have endured the rough ride of a failed startup (myself included), we would like to help accelerate the journey through the five stages of grief and get you back on the Silicon Valley horse (so to speak). To begin the therapy, here is the ultimate top 5 list of reasons most offered for startup failure….. Most of us have heard one or more of these. (#4 happens to be the one I’ve used most.) What’s interesting is if you perform an autopsy on all these modes of failure, a pattern arises. Each of these simple post-mortems is a slightly different expression of the same root cause – a weak customer problem. One of the best ever blog posts on startups is from Marc Andreesen in which he explains why a hot market is more important to startup success than team or product. But even if you agree with his arguments (as I do), there is still a small problem – most entrepreneurs are convinced they are in a hot market. Unfortunately, most of them must be wrong. Otherwise the overall startup success rate would be much higher. So what we need are reliable ways to measure the hotness of a market – as early as possible, ideally before we invest and spend money trying to build a product and a business. More specifically, we need to measure the hotness of a market in such a way that predicts whether a real startup with limited resources (read: limited product features) can actually build a business. The more important the problem is to your customer, the easier it will be to build a business despite a less-than-perfect product or a less-than-perfect team. Customer problems that create sufficient fuel to build a business have a special name – Monetizable Pain. It is the idea that a problem needs to be of a certain critical mass if a company that is small, undercapitalized, with no brand, and no track record is going to get those first customers and scale into a good business. If your offering provides relief for Monetizable Pain, you have a real shot at building a business. If it doesn’t, well, it’s going to be a long tough slog as a startup. The Land of the Long Tough Slog can be hard to see coming. Last week I was meeting with an entrepreneur who had an idea I personally love and honestly could see myself using. He’s been doing Customer Development and asked, “What do I do when it’s tough getting people to take time to talk about the problem?” And, “What does it mean if I have to prompt them quite a bit about the problem before they realize they have it? What if I’m sure they have the problem, but they need convincing?” Suffice it to say there is a lot packed into those questions, including how the entrepreneur is setting up the conversation, talking about the problem, and to whom. However, if he indeed is doing everything right (which is the topic for the next bunch of posts), then his challenges are in fact signals that he has not found Monetizable Pain. He is instead seeing signposts marking the path to the Land of the Long Tough Slog. It’s a place where the problem you are solving does exist, and you can indeed build a wonderful solution that your hypothetical target users tell you they love. But the underlying customer problem is weak – there is not enough pain there. Or in other words, it’s actually not a hot market. Which means you work darn hard, get nice props from your target customers along the way, yet never get to Product/Market Fit. “Merely Interesting” problems are smaller. They are attractive but are tough to build a business around. Merely Interesting problems usually come well-disguised with desirable traits that are perfectly designed to woo a budding entrepreneur. A cool solution to a merely interesting problem can generate buzz from the press and bloggers. (Think of Color.) It can get you meetings with prospective customers. It can make your sales people continually talk about how their prospects are really excited about your product. Merely Interesting problems produce recurring sales meetings with stories of the same “interesting” target customers who are always “interested” in your “interesting” product for their “interesting” problem. In fact, those wannabe target customers stay “interested” the entire time they are in the sales funnel – not only this month, but next month, and the month after that too. The problem is not that they aren’t interested – there is lots of interest – the problem is users aren’t growing, and/or nobody’s buying. Or – some do buy. But at a far smaller deal size or price than you modeled (remember those numbers in your “already conservative” spreadsheet? ) Or users do grow. But slowly. Merely interesting problems put you on a path to startup purgatory that is paved with people who love you but never write a check. Merely interesting problems are great at generating lots of buzz and interest in the free version, but never really deliver conversion to the paid version. 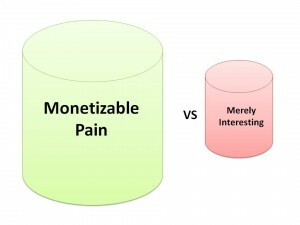 Monetizable Pain is the exact opposite. A startup that begins with monetizable pain is never characterized as a hammer looking for a nail. It will not be trying to reposition itself as a “must-have” 6 months after launch. It will never sit in the deadpool with the epitaph “we were before our time.” It will not be producing white papers to “educate” target customers on how they are really losing money but they just don’t know it. And it will not need an ROI calculator on its web site. You can test a problem to see if it is a Monetizable Pain problem. The test is fast – days or weeks, not months or years. You do not need to have a product to perform a test. You do not need a lot of money to perform a test. Taken together this means you can iterate quickly on the results and get closer with each test. If we can test for monetizable pain quickly, and iteratively, without spending a lot of money, we are able to begin our fast, accelerated journey through the loops. How do we do that? I’ll start offering those details in the next post…. Wonderful post, really gets to the heart of problems plaguing most startups! Thanks for the incisive insight, looking forward to more from your blog. How about the want vs need factor? I think people actually spend a lot of money on stuff they do not need or solve any particular problem. I’d been thinking about customer problems in terms of whether we’re providing a “painkiller or vitamin”. But even though we’re providing a painkiller, we didn’t find out how big a pain it was killing until we launched…. which is why the call-back test sounds awesome to test this quickly and cheaply. In addition to validating whether you’re solving a painful enough problem, I suspect it also provides insight on how to frame your pitch so it resonates with your potential customers. You’re serving up gems, Mark – please keep sharing! This is great detail and an excellent clarification of how to monetize. I have pressed through amazing amounts of testing to try and arrive at solutions that were satisfactory for the end user, that we were able to deliver in a format that allowed us to scale, and articulated well enough that the pain would would lead to purchasing. Thanks again for such in depth conversation and insight, very helpful ! Can’t wait for the next part to make sure that I’m on track ! Wow, very interesting insights. We are organising a huge startup competition at CeBIT Germany. Will be interesting for our participants, so I shared it to our FB page. PS: Would you be interested in giving us an interview for our blog regarding mobile innovations and future trends?